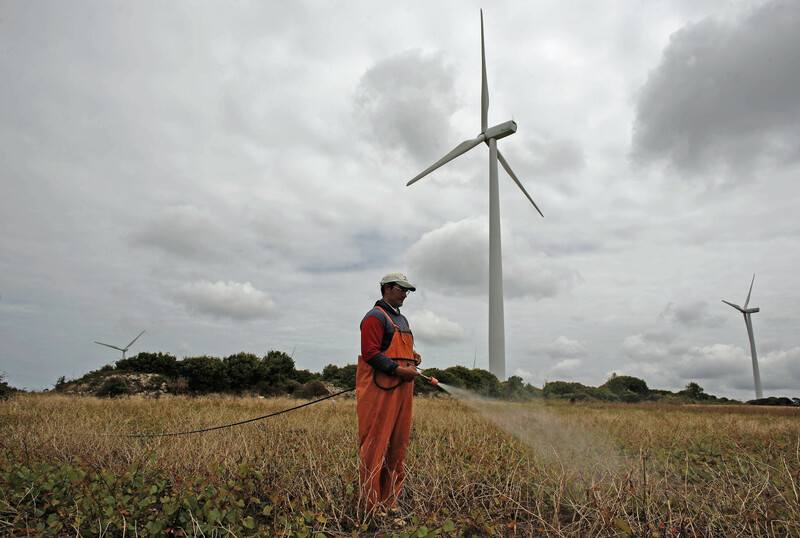 A farmer works near wind turbines in the Sierra del Rey mountain range, about 100km (62 milles) from Lisbon June 2, 2008. China Three Gorges is set to launch an offer to buy out the 76.7 percent of Portuguese utility EDP it does not own, according to a person familiar with the situation. CTG envisages that EDP will retain a public listing after the offer, the person said. If the offer is successful, CTG will also fulfil a legal obligation to launch a mandatory tender offer for 100 percent of the share capital of EDP Renováveis, excluding the 83 percent already owned by EDP. CTG bought a 21.4 percent stake in EDP for 2.7 billion euros in December 2011. It currently owns 23.3 percent of the company.